What exactly constitutes someone being considered an “expert”? There are many qualities you can contrive in order to define the word, but I am pretty sure, that at the end of the day, no matter what you think of, historian and author J. David Petruzzi would always be considered one when it comes to the American Civil War. 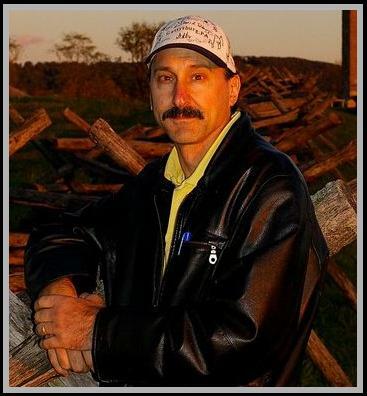 He is the author of five books on the subject, including the freshly released New Gettysburg Campaign Handbook, which has been described as a must-read for diehards and newbies alike. With another trip to Gettysburg coming up in the next couple of weeks for me (have not yet decided on the dates), I think I am going to pick up a copy and take it along with me, because it seems to be the real deal according to the reviews. GC:You are serving as a historical adviser to the upcoming mini-series To Appomattox. What exactly will your job entail? JDP: First, I’m really humbled and honored to be a part of this, which I truly believe will be the media event of the Sesquicentennial. It’s all been very exciting, because I’ve never been involved in something of this scope and magnitude. My initial duties a few months back entailed two things: First, I was asked to read the entire script and offer historical accuracy suggestions. As an aside, I was hooked after the first few pages. From the very first scene in the first episode to the last scene of the last episode, it is an amazing story. Writer Michael Frost Beckner is a life-long student of history (he also has ancestors who fought in the war) and his research went extremely deep, so the writing was already very accurate from a historian’s point of view. I just caught some things here and there and helped Michael do a few rewrites and modifications. Second, I assisted in assembling a world-class team of consultants, each of them with a particular specialty. We have a uniform expert, a flag expert, personality experts, battle/campaign experts, and so forth. We’re all experienced enough to know that some historical boo-boos will creep in here and there, but our team is comprised of the finest in their fields. Viewers will have the confidence knowing that in each scene, within the context of the dramatic storytelling, every word uttered by every character – every item in the shot – every military action portrayed – will be historically accurate and plausible. My primary duty now is to bind the script of each episode, and begin making a collection of them with all of my historical notes and supporting material with them. For example, each episode, page-wise, runs about 65-70 pages. By the time I’m done, each of my episode binders will consist of about 200 or more pages. I’ll also be collating the material of the consultants. Therefore, as each and every scene is being blocked and prepared, we’ll have information at hand which gives us all of the historical accuracy details ready and available. If there’s a flag or flags in a scene, we’ll have the right ones. If Robert E. Lee, during the Mexican War, is in a scene, it will list what he looked like at the time, and exactly what his uniform should look like. When U.S. Grant’s home, “Hardscrabble,” appears in an exterior shot, there’s a photograph of it. Michael and I speak just about every day, often several times a day. He has me participate in just about everything having to do with the historical environment of the series, and that means assisting with things like enlisting corporations that provided consumer goods during the war to be sponsors and/or advertisers. I’ve assisted in preparing printed presentations submitted to many entities having connections with the series. It’s been great fun, and I enjoy helping any way I can. Once pre-production begins in the spring of next year, my full-time work begins. From pre-production through the end of filming, I’ll be full-time on the set. I very much anticipate that, and it’ll be a lot of hard, long work but a great deal of fun. As Historical Adviser, I’ll be working personally with the actors and actresses, helping them understand their characters and hopefully in some small way to help them give a believable performance. Michael has written into this story no caricatures, no icons up on pedestals – these historical figures are shown as exactly who I believe them to have been in real life… human, fallible, successful, and failures. Angels didn’t sing when Lee walked into a room, but his men loved him and his enemies respected him. Grant wasn’t a slosh who spent all his time on the floor passed out (though some would have you believe that). He had only periodic struggles with alcohol, and that because he was often very lonely – he dearly loved and often ached for his wife and family – and his internal conflicts with his failures in life. I think when folks are finished watching this series, they will come away feeling that they understand Grant and all of these men and women much more clearly. On the set I’ll also be coordinating, as the head of the Historical Department, the efforts of consultants and the crew assembling sets, reenactor/extra coordinators, battle scenes, etc. Basically, any way that I can assist the producers, director, and all departments regarding history and accuracy. When I don’t know an answer, I have to find it. But as I mentioned earlier, Michael has written such a wonderful script that my job won’t be nearly as difficult as it otherwise could be. Once filming and editing is complete, I hope to continue to be involved as Michael’s ambitious list of “extras” are worked on. We plan to include, in the resulting DVD boxed set that will be released, to have a “Behind the Scenes” documentary, mini historical documentaries, educational tools, etc. We really want the entire To Appomattox experience to be just that – an experience. We don’t want it to be over for the audience once the final episode begins. Truly, it is then that the real learning and teaching begins. GC: As it stands in pre-production, what are your hopes for what this series will accomplish? JDP: I touched on that a bit in my previous answer – I hope that viewers come to begin to understand just in what environment the war took place, and who these people were who fought it, planned it, and those who waited at home and worried. Today, we look at a picture of U.S. Grant and see a black and white, detached-from-us-today photograph. But what was he thinking at West Point? What was his relationship with James Longstreet? What were his struggles with civilian life failures, alcohol, and loneliness? What was it like to be in a room with George McClellan before or during the Civil War at particular times? How did all these main characters – Grant, Longstreet, Lee, William Sherman – and all of their mutual friends interact with each other over several decades? What did they laugh about? What did they worry over? What did the war do to their relationships? All of these and more are dramatic limbs among the dramatic spine of the series, which is Grant’s memoirs. I also hope that it will go a long way toward getting young people more involved and interested. It is they who will carry on the work of understand the war properly after us. We are, after all, within the Sesquicentennial and interest in everything about the war is at an all-time high. If one child turns to a parent and says “Let’s go visit Gettysburg – or Shiloh – or Chickamauga” then it’ll have all been worth it. Further, to be quite blunt, I believe the series and the portrayal within will knock a few pedestals out from under some “iconic” figures – as it SHOULD be. It’s not an intentional effort to make any of these historical figures any less than what they were… quite the opposite, in fact it is to portray them (most often in their very own words) as they really were. They laughed, they cried, they stumbled, they were successful, they failed. And many of them leashed Hell upon the earth and to each other. An enormous percentage of Civil War soldiers died on battlefields utterly alone. In the dirt. In their own blood. Perhaps clutching a picture of their wife or a child. And their everlasting legacy on Earth was to be tossed into a trench, their identity never to be known again. Many families didn’t have even a grave to mourn over. Thousands of soldiers today still lie in parts unknown, all but forgotten. Theirs and many like stories are another foundation of this series. GC: What is your favorite Civil War movie of all-time, and why? I love so many – The Horse Soldiers, The Outlaw Josey Wales, Glory, you name it. But probably my favorite is Gettysburg, based on the Michael Shaara novel The Killer Angels. Much of the dialogue is just plain silly, but it was Shaara’s interpretation of those characters and they’re simply wonderful. Admittedly, the movie has set standards by which many reenactors and living historians now do their craft. For instance, Longstreet never wore the huge hat (it should have been given its own zip code) that actor Tom Berenger wore in the movie. Longstreet typically wore a regular kepi. I’m told that while in the town of Gettysburg prior to filming, Berenger went into the store Dirty Billy’s Hats and asked for the biggest hat in the place. Folks tried to tell Berenger that it would be inaccurate for Longstreet, but he wore it anyway. Now, when you see one of the dozens of Longstreet portrayers around, they’re all wearing one of those huge hats for fear of not being “recognized.” Many of them know better, but it is “Longstreet pop culture” to wear a big hat even though it’s utterly silly and inaccurate. But if a Longstreet portrayer showed up at a reenactment wearing the correct kepi, no one would know who he was. And that’s understandable. But in our series, Longstreet wears the right clothes during the war, and none of the uniforms will look like they were just pulled off a Hollywood wardrobe rack. But all of that aside, every time the movie Gettysburg is on, I can’t take my eyes off it. All of the actors are simply fabulous and I utterly enjoy watching it. And if the pre-Pickett’s Charge bombardment and the Charge itself doesn’t touch your heart, then you need to check your pulse immediately. 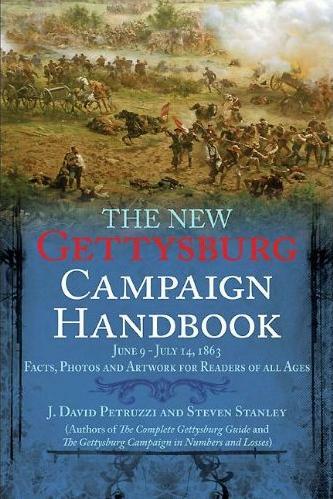 GC: You recently just published another book, “The New Gettysburg Campaign Handbook”. Can you tell us a little bit about it? JDP: Thanks for asking about that – folks who know me know that I never turn down an opportunity for shameless self-promotion! In the Savas Beatie “Handbook” series, it’s a neat little companion to The Complete Gettysburg Guide that I also did with master mapmaker Steven Stanley. It contains a lot of material that we couldn’t include in the Guide – things like Gettysburg Campaign facts, trivia, personalities, and even Medal of Honor awardees. There’s a photographic study of the entire five weeks of the campaign. There’s also a comprehensive Order of Battle that is the most accurate and up-to-date available. Steve designed the entire book for our publisher, did all of the maps (he’s the best in the business bar none) and it’s simply gorgeous to look at. Steve and I are working hard on many more books – such as a Maryland Campaign Guide and others – and I’m simply blessed to be partnering with him on these projects. Between the two of us, Steve has more talent in his little finger than I’ll ever have, period. GC: Back in May you wrote a scathing review of the History Channel documentary on Gettysburg (as did I). How is it possible, with so much information out there, for a major production to be so misinformed and inaccurate? JDP: Oh yeah, I ripped that show and to think of the thing still makes me ill today. It was that bad. How something like that can air? I think much of it has to do with marketing and trying to appeal to an audience which today is pretty inflicted with ADD. And I also know that the writers and producers didn’t consult with the historical advisers and consultants beyond just their few minutes of speaking throughout the episode. If they had – consulted with knowledgeable folks like Garry Adelman and such – most or all of the garbage that aired wouldn’t have seen the light of day. It was filmed in South Africa literally on the cheap, so the terrain looked nothing like Gettysburg (unless Gettysburg is comprised mainly of acres and acres of sand and pine stands and I’ve somehow missed that). If you read my review of the show, you’ll see that I point out an error committed just about every minute, and I actually didn’t include most of them. The show was very, very hard to watch, and my wife kept running into the room thinking that I was screaming in physical pain rather than mental. I’ve seen only a couple positive comments about that show, and universally everyone trashed it. All the CGI and graphics done by the Scott Brothers studio – which was brought onto the project only at the very last second in order to do the CGI and attach their names to it – couldn’t save that show from making everyone’s eyes bleed. The History channel can only do the right thing by burning all copies of that program and never allowing it to see the light of day ever again. It also bears mentioning that such historically deficient tripe places even more expectations on us and our series, and we plan to rise to it. Glaring historical inaccuracies in personalities and the set will only distract viewers, and we don’t want that. We want everyone – student and scholars of history to those who know very little about it – to enjoy it and learn from it. The demographics of our expected audience are enormously broad. Not only will Civil War folks watch this, but, for instance, fans of Rascal Flatts (who is doing the music score and acting in it), fans of NASCAR drivers participating, and fans of the particular actors and actresses. We have a heavy responsiblity to each of them to do this right and honorably. GC: Lastly, aside from Gettysburg which you have invested so much time in, which is your favorite battle? Who is your favorite general? And why? JDP: I dearly love Antietam. It’s so quiet and non-commercial there, a stark contract to many things about Gettysburg. Watching the sun set from Little Round Top is always awesome, but watch the sun come UP from the area of Burnside’s Bridge, and now you’re talking my language. The area of the Cornfield there always gives me goosebumps, and I can’t help when walking the length of the Sunken Road (Bloody Lane) and just nearly tearing up as I look around an envision all those dead young boys of both sides that were in and around that. Because of my interest in the cavalry, another favorite field is Brandy Station. For us “Cav” folks, Brandy is the Motherload. There, the cavalry of both sides brought “Thunder on the Plains.” When I’m standing up on Buford’s Knoll or near Fleetwood Heights, nothing else in the world matters at that moment. If you asked others about my favorite general, they’d all probably assume John Buford. And they’re probably right. I admire the guy. Soft-spoken and reserved, but he’d dangle you from the nearest locust tree if he suspected you just didn’t smell right. I’d have loved to have been on a battlefield with him. I also like Winfield Hancock. Guy always had a clean white shirt on no matter what, and he could swear a blue streak said to have made flower wilt at his feet, and if any ladies had been present they’d have fainted dead away. His men felt invincible near him, and that fella would have been one to have shared a wee nip with. I bet he had stories. I also like to study the cads, the scoundrels. Speaking of having a whiskey with someone, Dan Sickles would probably be the ultimate party dude. And a fellow like Judson Kilpatrick fascinates me. Snarky, shrill, but hell-bent-for-leather. It’s why Sherman wound him up and turned him lose. Kilpatrick had a habit of getting just about everyone and everything around him send to Providence, but his personal traits are both confusing and fascinating. Truly, I like ’em all. Everytime I discover an officer or common soldier with an interesting story, I just have to know more. That’s what keeps this so exciting and endless – there are quite literally millions of stories out there, and millions more to find. Among those millions of stories, our To Appomattox series will bring some of them to people’s living rooms – and hopefully their hearts. It is there that the seed of curiosity is born. I would like to thank J.D for an absolutely enlightening interview! Reading and digesting this really makes me excited for 2013, when we will see this television series released. I had been trying to keep up with it, but with different updates being posted daily from their Facebook Page, I figured one day, I would just sit down and browse through all of it. This interview has given me just-cause to do that, because I don’t think I have felt this much excitement since 2003, when as a 12 year old, I waited with anticipation for my favorite Civil War film, Gods and Generals, to reach theaters. I cannot promise to provide as much coverage for To Appomattox as I did with G & G, but this is as good a place as any to start. Many thanks again to J. David for taking the time to type all of this out and send it over—this could have been a book in itself! Great job! Cannot wait to see it! Thank you so much Greg! We’ll keep you in the loop as the production progresses! Excellent interview, Greg! J.D.’s knowledge will be a great resource for the production team. God bless! J.D. is always inspiring to listen to and he matches Beckner for passion for his subject. This interview needs to be promoted on Facebook and everywhere else Civil War enthusiasts connect – all the organizations like Civil War Round Table and so many others need to be aware of what is in preparation and the vision, creativity and dedication mounted to accomplish this wonderful task. We are all going to be richer for for it. Our ancestors should be proud.